You are here: Home / Articles / An American Dream? Our friends from over the ocean do like a dream, many American visionaries have created legacies from sharing their ‘dreams’ and there’s nothing with our new owners to share theirs, and importantly for us to believe in it. There isn’t a lack of trust or belief in our very own Huw Jenkins, just this weekend he described the new relationship as a ‘dream’ partnership so that’s endorsement of the highest order. He doesn’t say what he doesn’t mean our Huw, he’s Mr Straight Talk. From my perspective, early signs are very good. 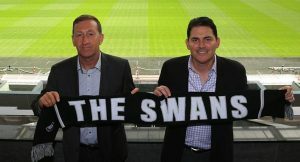 They are publicly sharing their vision for the club, splashing out on a new record signing, keeping Gylfi on better terms to deter a series of big bids, progressive talks with the council about the stadium, plus investing in many of the squad on shorter contracts to protect our assets. Even attending our first home game is a public show of commitment, but also they seem very interested in the enjoyment of watching our Swans. Most foreign owners don’t bother. These are all very positive signs and cannot be overlooked supporting their commitment to the cause in the early days. Of course selling Ayew and Ash makes us weaker, but consider a few things. Swansea City should not keep players who don’t want to be here, it’s more brave to move them on on the best terms possible than keep them at the club doing ‘a Berahino’. They were decisive on both and the exits were swift and clean. I’ve heard and read of the ‘asset stripping’ signals of these sales, but let’s be clear the only asset the club has are its players. The only value of a club like ours for such American investors is that of an income generated from Premier League status, championship status is not an option for the consortium involved and would see their return plummet. They cannot allow such relegation to happen during their ownership. Personally, I find the blend of foreign and local ownership an exciting opportunity, given the shared vision that the collective team have for our Swans. Things change constantly in every business, not always for the better but I’m dreaming of what this could become during the next decade with fresh ambition and a dynamic committed team leading our club into a new chapter. This guest post was written by Alec Johnson or Jack Barmy to those of you on Twitter.